In the years since the 2011 revolutions, Egypt and the Arab countries in general have moved from a profound moment of hope and democratic potential to deepened authoritarianism and outright war. Among the many political actors who have seen their political prospects rise and fall are youth activists, the revolutionary vanguard who spearheaded the transition process. 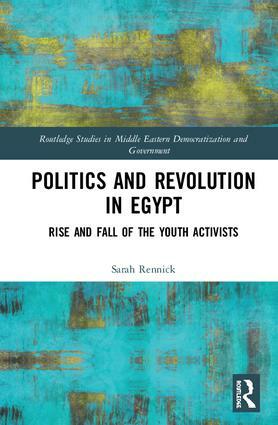 This bookoffers a detailed analysis of Egypt’s revolutionary youth as a collective and non-institutionalized political actor since 2005, bringing forth in particular the organizational, ideational, and strategic dimensions of the social movement. It offers insights into the origins of the movement and its evolution over time, the activists’ claims and objectives, and the rationale behind their actions/interactions in the greater political arena. Proposing a theoretical framework that lies at the nexus of practice theory and social movement theory, the book demonstrates how the foundational practices of "youth" and "revolutionary" acted as the movement’s internal culture, shaping the activists’ claims and goals, their organizational structures, and their choice of strategies and repertoires of contention. In the context of a defunct Arab Spring and the region’s descent into deepened authoritarianism and ultra-violent conflict, the book sheds light on the Egyptian uprising and the reasons for its increasingly grim outcome by providing a detailed analysis of one of its key players and both the exogenous and endogenous reasons why the revolutionary youth activists failed to achieve their goals. As the first book to assess the revolutionary youth as a social movement distinct from other forms of activism and other youth groups/parties in Egypt, it will be a valuable resource for anyone with an interest in Middle East Studies, the Arab Spring, or social movements more generally. Sarah Anne Rennick is a researcher at the Arab Reform Initiative in Paris, France. Her research focuses on social movements in the Middle East, analytical concepts of youth and new forms of youth engagement, and peace processes in the MENA zone.